counts orchestrate, a meadow (or weekly practice with breath), 2017. Photo by Ryan Collerd. Anthony Elms is Chief Curator at the Institute of Contemporary Art in Philadelphia, and is also the Editor of WhiteWalls Inc. His writings have appeared in Afterall, Art Asia Pacific, Art Papers, Artforum, Cakewalk, May Revue, Modern Painters, New Art Examiner, and Time Out Chicago. He has also written essays for many catalogs. As an artist, Elms has been included in projects exhibited at Gahlberg Gallery (Glen Ellyn), Hyde Park Art Center (Chicago), Mandrake (Los Angeles), Mess Hall, Randolph Street Gallery, and VONZWECK (Chicago), among others. He has independently curated many exhibitions, including: Sun Ra, El Saturn & Chicago’s Afro-Futurist Underground, 1954-61 (with John Corbett and Terri Kapsalis); Interstellar Low Ways (with Huey Copeland); Can Bigfoot Get You a Beer?, and A Unicorn Basking in the Light of Three Glowing Suns (both with Philip von Zweck); and was one of three curators of the 2014 Whitney Biennial. He is currently co-organizing an exhibition of the work of Christopher Knowles with writer Hilton Als. 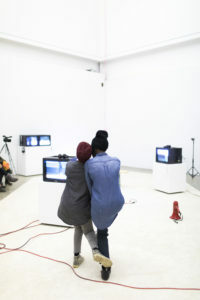 Having received both a BFA and MFA as an artist, Elms has been included in projects exhibited at Situation Room (Los Angeles), Beaufort Beyond Borders (Belgium), and peregrine program (Chicago), among other places. Previously, he worked at Gallery 400 at the University of Illinois at Chicago, and before that, the Renaissance Society at the University of Chicago.